It’s easy to be tempted by grocery store shortcuts for Mexican food. There are so many options! But I come bearing good news: from-scratch Mexican cooking is easier than you think, even with kids running circles around your kitchen. It’s healthier, too. This easy red enchilada sauce is proof. A lot of traditional Mexican fare is simple food that doesn’t take so long, as much as require a few fresh, authentic ingredients that lend big flavor. And many more complicated Mexican recipes are easy to make ahead of time. Beans—make them ahead. Moles (even “quick” versions)—make ahead. Salsas—make ahead. Stews and soups—you got it, make ahead. They are even better the next day! This enchilada sauce is no different. 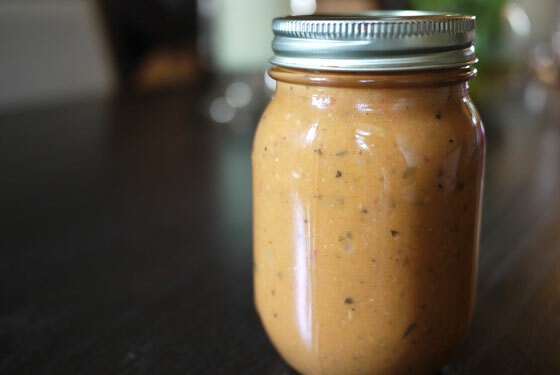 You can make it ahead of time and store it in an airtight container in the fridge for up to five days. You can even freeze it. It comes together 1-2-3 and is so much better than the store-bought stuff. Promise. This sauce is best paired with black bean and cheese enchiladas. (I prefer my chicken enchiladas with green sauce, but this goes well with chicken, too.) It also doubles as an all-purpose sauce for other Mexican dishes. Use it to flavor a side of rice and beans or sautéed veggies for a quick weeknight quesadilla. Don’t be afraid to go homemade with your Mexican cooking. It’s healthier, easier than you think, and tastier than you know. 1. Heat oil in a saucepan over medium heat. Add onion, sauté for about 2 minutes before adding garlic. Continue cooking until onion and garlic are fragrant and translucent, about 5 minutes. 2. Add chipotles, flour, cumin, oregano and chile powder. Stir until you’ve got a fragrant paste, about a minute or so. 3. Add broth and chopped tomatoes. Bring to a low boil and cook for about 10 minutes to bring all of the flavors together. Remove from heat and, using an immersion blender, blend the sauce until smooth. 4. Return sauce to heat and cook for another 5-10 minutes until desired consistency.